Fluke Advanced version power logger has an internal flash memory storage. It has a voltage rating of 1000-Volts at 42.5/69-Hz. It works on 3.7-Volt 9.25-Watt-Hour lithium-ion battery. Wireless power logger has a measuring range of 1 to 150-Amps AC/10 to 1500-Amps AC and power factor of +/- 0.025. It has a maximum power consumption of 50 VA and maximum no-load consumption of <0.3-Watt. Power logger has four voltage inputs and two auxiliary inputs. It has a 2-m TPR/PVC output cable. Power logger with 480 x 272 Pixels LCD display, has a time interval of 10 mins. Power logger offers fast insight into overall electrical system health with a power quality health summary. It helps to capture the right data every time with a quick, guided, graphical user interface. It also reduces uncertainty about connections with the intelligent verification function. Power logger allows to complete field setups through the front panel or the fluke connect app on smartphone. 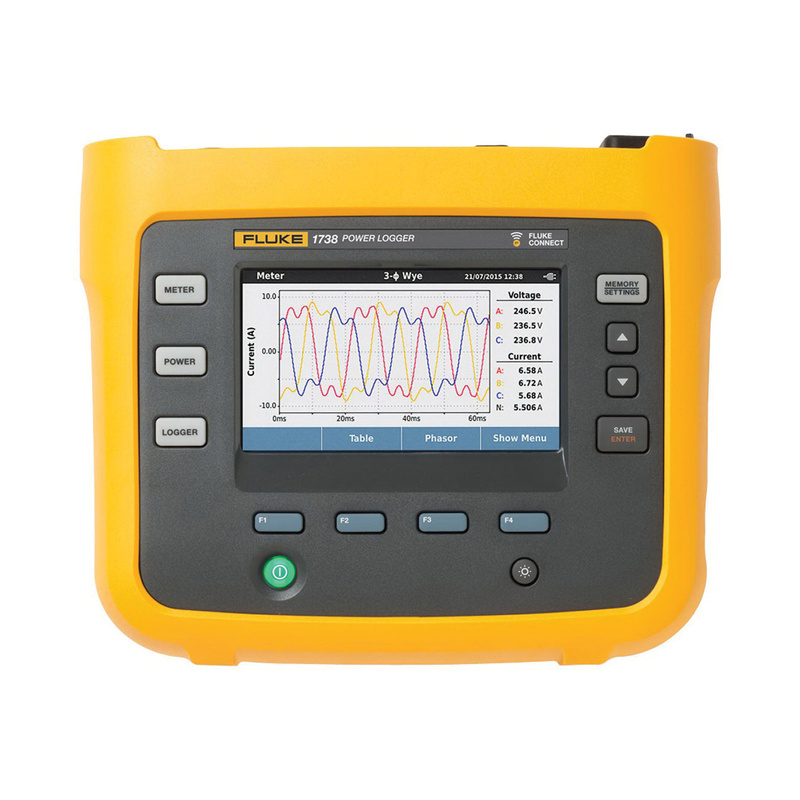 It features fully integrated logging with other fluke connect-enabled devices to simultaneously log up to two additional measurement parameters on a fluke connect wireless digital multimeter or module. Power logger has energy analyze plus application software that enables you to analyze every detail of energy consumption and power quality health and create automated reports. The power logger with a charging time of <6 Hours, has an efficiency of 68.2%. It offers an input impedance of 10-Mega-Ohms. It measures 7.8-Inch x 6.6-Inch x 2.2-Inch and withstands a temperature ranging from -10 to 50 deg C. Power logger meets CE and CSA standards.